Gas mask boxes were mainly used in World War II-era Britain. Because of the frequent bombings in England, all residents were issued gas masks and were required to have them with them at all times. The gas masks were bulky and citizens created gas mask boxes they could carry like back packs to hold the masks. Many teachers now create these boxes as demonstrations for children learning about World War II. Lay the cardboard out flat and locate the center of the width of the cardboard. The box is created by drawing out the folds, then folding the cardboard to make the box. From the center point, measure out 3.35 inches on both sides of the center, and draw a straight line from point to point. Draw one straight, 20.3-inch line down the cardboard from each of the two ends of the line, and connect these two lines at the bottom with a straight line. Measure 1.1 inches from the top line and draw a horizontal line across the rectangle. Measure down from that line 4.3 inches, and draw another line that stretches across the rectangle. Use the ruler to mark 5.3 inches from the last line and draw another line. Draw the sides of the box. Draw two lines that extend outward from the last line drawn on both sides. The lines should be 7 inches long. Repeat this process on the second to the last line drawn and connect the lines together at the end with a straight line. You now have what looks like an upside-down cross. Measure from the outside line you just made toward the middle 2.65 inches, and draw a line at each point. Measure 4.3 inches from each point inward and draw another line. Create the flaps that will be glued down. The flaps are attached to the side of the 4.3-inch boxes and taper off to 3.5 inches. Measure 1.1 inches from the outside lines of the boxes you just made and draw a line that is 3.5 inches wide. Draw diagonal line from the side to the new lines. Cut around the outside edges of the box template. Lay the ruler on the card board at one side of the 5.3-inch box in the center of the cross diagram. Fold the side up at the line. Continue to fold up the sides creating the bottom and sides of the box. Place glue on the flaps and fold them so they slide inside the sides of the box. Hold the box until the glue dries. Fold the side pieces at a 90-degree angle at the lines drawn and then fold the top over the box. Bend the cardboard on the last line and create the top flap on the box. Cover the box with canvas and glue the shoulder straps on the box. 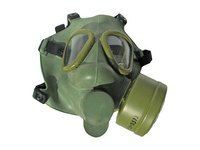 Instruction for the gas mask can be found at The South East Grid for Learning website. You can print these instructions and place them in the lid of the box.